Pixi Beauty Glow Mist Argan Oil and Propolis- I can never have enough of this, love it over my make up for a dewy finish but I also included in my night skincare routine. I definitely need a big bottle of this glow mist in 2019! Deciem Hylamide Density Mist is an advanced treatment to support dermal water density for intense lightweight hydration and comfort. Vegan, cruelty free, silicon free and even water -free. Pixi Jasmine Oil Blend (such an amazing oil blend, it smells divine ) and Overnight Glow Serum- always out of stock and my bottle has only few more drops left. Overnight Glow is an innovative, exfoliating treatment. This Glycolic rich formula 10%, gently exfoliates your skin while you sleep encouraging collagen synthesis and maintaining skin elasticity. You can read more about these 2 products here. Pixi Beauty Sleep Cream is nutrient rich but with a light and beautiful texture, 100% delicious mango butter, oils of lavender, lemon and bergamot. Extremely nourishing and calming for dry skin. Nuxe Huile Prodigiouse Rich Oil - another old love of mine. I am addicted to this iconic dry oil for so many years and I simply cant live without it as it smells divine. 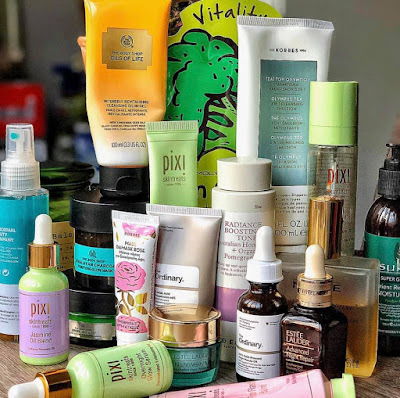 I lost count of how many products from The Ordinary I bought in 2018! Azelaic Acid Suspention 10%, Argan Oil and Marula Oil are some of my all time favorites since I discovered Deciem products in 2017. You can read more info about these products here. Estee Lauder Nightwear Plus anti -oxidant and detox night cream -love how fresh this cream smells, very lush, depuffing and refining the texture of the pores over night. You can read a review here. A big obsession in 2018 were "sleep in mask products" such as The Body Shop Drops of Youth Sleeping Mask and (read more about it here) and Korres Over Night Anti Fatigue Mask Damask Rose with a delightful rich formula and a lovely romantic rose smell. The Body Shop Himalayan Charcoal Purifying Glow Mask is a fabulous skin hero, prevents and fights unwanted blemishes in just 3 minutes. Detailed review here. If u haven't tried products from Sukin please do it because they have such affordable and really good natural, vegan skincare, such as Nutrient Rich Facial Moisture Cream with Kale, Spirulina and Parsly - it feels like skin food for my face and makeup looks amazing over it. This one is really good, makes you have soft baby skin in 3 minutes! Oh this is so interesting to read as I really want to try new skin care ranges this year. Argan oil is a staple here though, I love it! Laura,same with me. I use so much pure Argan oil on my skin and also on my hair,I cant live without that oil. Thank you for taking time to read ! Those masks are really amazing,love them! Your toner must be so great! With honey and pomegranate? I'm already loving it. Mine has pomegranate extract and I love it! I love that toner a lot, smells nice and yes pomegranate is full of vitamins. Pixi Glow tonic!!! YESSSS that's also such an amazing product.I agree with what you said about the eye cream and now I realize I forgot to include the eye cream in this post.I am so happy to see that you feel this way about skincare! Thank you,beauty ! My daughter would mostly be interested in the skin care fask masks. But honestly she would be into any of the skin care products. This is a great list! I’ve actually been looking for some new masks to try! Can’t wait to check one of these out! Thank you! I hope you like them,enjoy ! I am such a sucker for a good face oil! They are so hydrating and easy to put on. So good! Me too,and you don't eve need to pile up on extra moisturizer !